I have a confession to make: I am not a foodie. I enjoy going to restaurants, but unless something goes horribly wrong with my entrée, the actual food I eat will not be the determining factor in whether or not I rant or rave about my experience; that is usually reserved for the service experience. I would say that is true beyond dining, too. Buying a suit, getting a haircut, or having the oil changed – the customer service experience is what really puts one vendor or service provider over another. A colleague recently pointed out that you can take the same Boeing 737 from Chicago to Dallas for roughly the same price on Southwest, United, or American. The only real difference is the customer experience. Add this to the power of customer review sites and social media and the customer service reputation of a company can make or break its success. 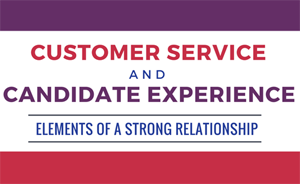 In the infographic below, we’ll take a look at ways these elements can be expressed in both the customer and candidate experience.